My research focuses on answering fundamental epidemiological questions where spatial and spatio-temporal methodology are critical. I (along with students and other colleagues) am interested in developing new, robust geocomputational methodologies that deepen our understanding on the dynamics of infectious and non-infectious diseases. I am concentrating efforts in the development of new visualization techniques to detect space-time patterns at different scales (e.g. clusters), and leverage on state-of-the art computational techniques (e.g. cyberGIS, parallel computing) for unusually large datasets. I am interested in students with strong computational, visualization skills and interest in health geography. 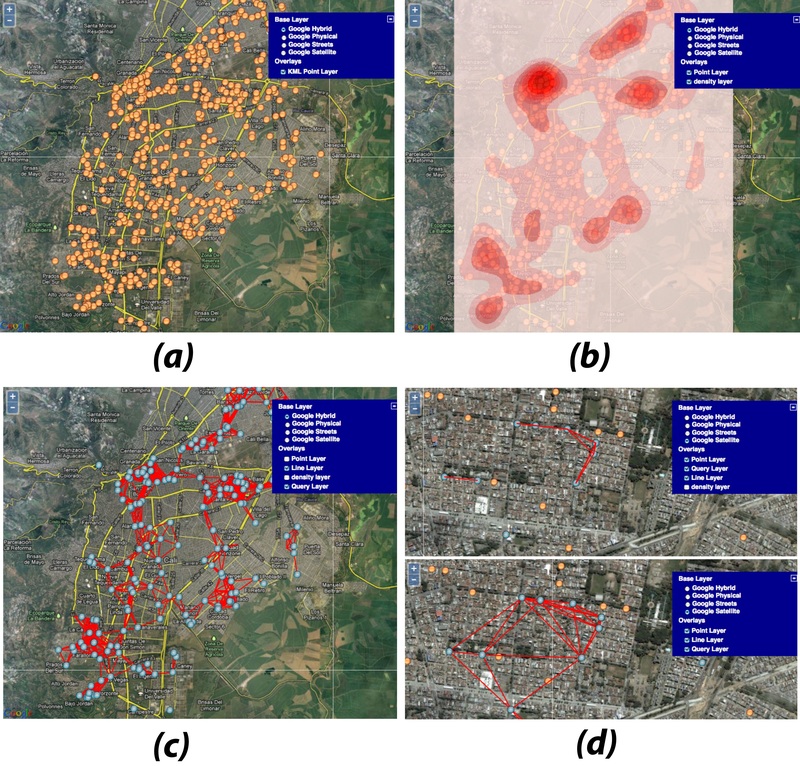 We conduct the Space-Time Kernel Density Estimation (STKDE) in a parallel computational framework to map space-time clusters of dengue fever in an urban environment of Colombia. We extract intricate disease dynamics in an interactive manner, using a powerful 3D environment. Findings from our work can help better understand the dynamics of a quickly spreading disease. 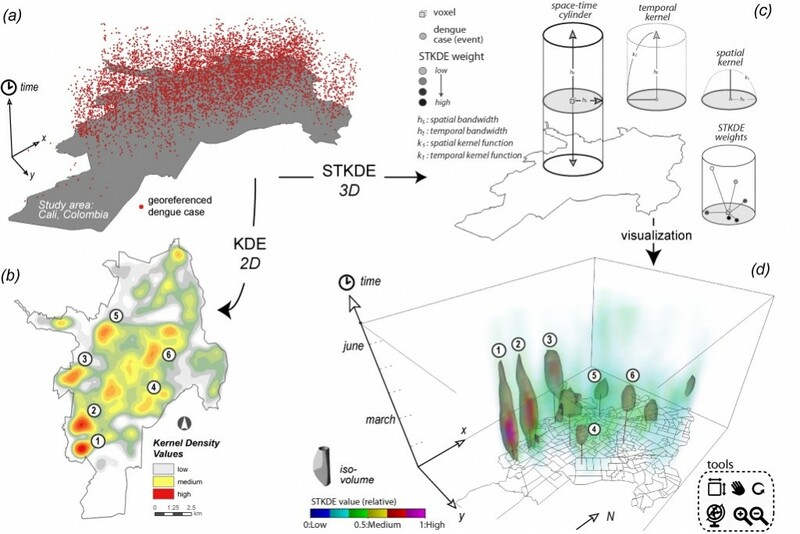 Space-time distribution of dengue fever cases for Cali, Colombia for January to June 2010 in (a), KDE in (b), STKDE concept in (c) and STKDE visual in (d) using an iso-volume value of 0.5 (time granularity: days). 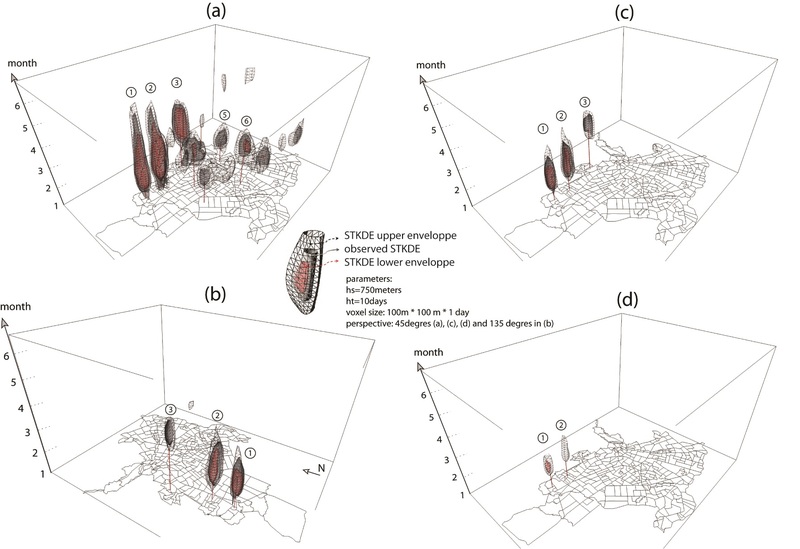 Clusters 1 and 2 are more elongated than clusters 5 or 6, but cannot be inferred from (b). Spatial and Spatio-temporal algorithms are computationally intensive. For instance, to evaluate uncertainty in clustering tests, one must conduct a large number of Monte-Carlo simulations. 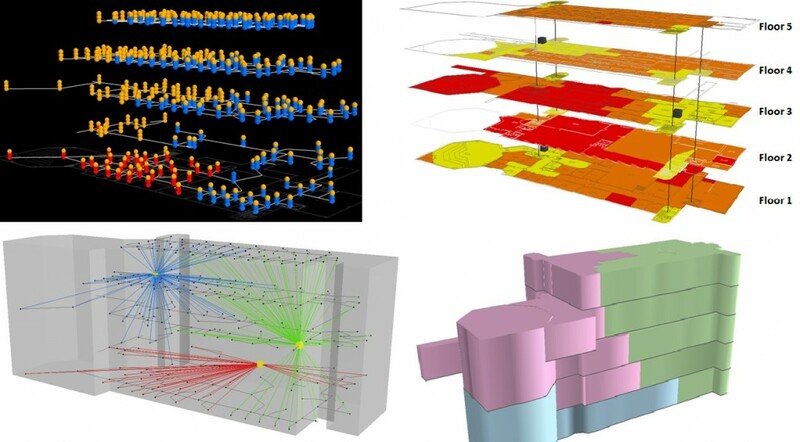 We are interested in developing robust computational methods to facilitate these simulations. Parallel space-time cluster analysis accelerated using multi-GPUs (STKDE is used as an example). 3D space-time decomposition (A); computed on GPU devices in a parallel manner (B); cluster outcomes of cubes are aggregated to form the final space-time cluster pattern (C)). Iso-volumes on geocoded dengue cases (in grey). Same value iso-volumes are generated for STKDE on the perturbed dengue cases, showing minimum extent of the cluster (in red) and maximum extent of the cluster (in black). Iso-volume cut-off value of 0.5 in (a), 0.7 at a view angle of 45° in (b), 0.7 at a view angle of 135° in (c) and 0.9 in (d). We develop predictive models of dengue incidence rate, based on relevant local weather and regional climate parameters. We analyze time series of epidemiological and meteorological data for the dynamic urban environment of Cali, Colombia from January 2000 through December 2011. 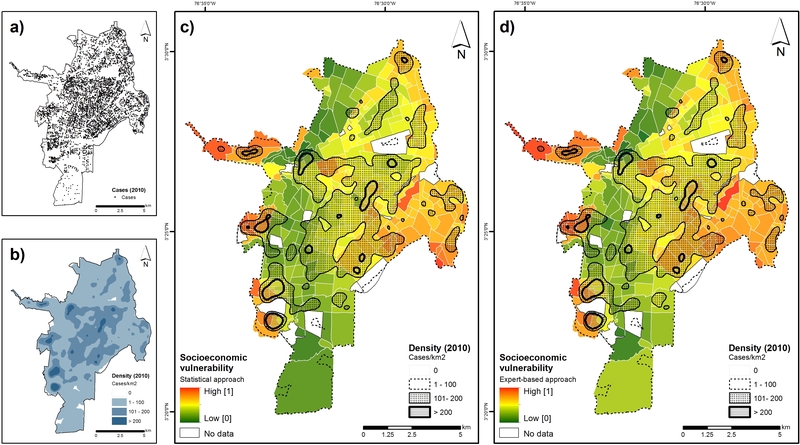 We develop environment-based multivariate auto-regressive forecast models that allow dengue outbreaks to be anticipated from 2 weeks to 6 months in advance. Our results have the potential to enhance existing dengue early warning systems, which can ultimately be used to support public health decisions regarding the timing and scale of vector control efforts. 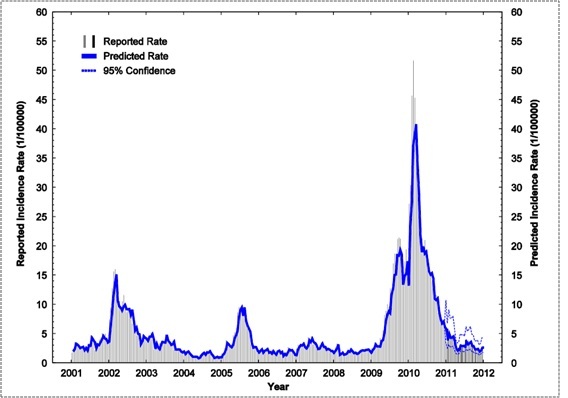 Reported and predicted intra-seasonal dengue incidence rates from 2001—2011. The reported population-adjusted bi-weekly dengue incidence rates (DPOP) during the model development period (2001–2010) are shown by vertical gray lines, while reported rates during the model verification period (2011) are shown by vertical black lines. One important component of research within the Center for Applied GIS is the development of tools and techniques available for different communities. This is critical to disseminate findings among different communities, and foster knowledge discovery. We have developed an interactive online GIS application with the objective to monitor dengue fever outbreaks at different scales. Our on-line toolkit allows to 1) deploy and share epidemiological data information at the individual point level, 2) conduct temporal and spatial queries on dengue fever events, 3) generate spatial distribution maps in a raster format across a region within a reasonable computational time to better determine the occurrence of hot spots and 4) visualize space-time connection among disease events locally. Maps generated from the on-line dengue fever monitoring toolkit: a) dengue fever cases for the city of Cali, Colombia for the first two weeks of February 2010. Theoretical one-way travel time to hospitals used by infants with spina bifida without anencephaly born in Florida, 1998-2007. Aggregation of one-way travel time in Figure (b); estimated average one-way travel time for hospitalizations, averaged per infant per hospitalization and aggregated at the county level (Figure c). Figure (d) summarizes the difference in one-way travel time (theoretical minus estimated) for those hospitalizations. Counties forming a significant local cluster of higher one-way travel time are outlined in blue (LISA statistic). comparison of vulnerability at the neighborhood level. Different 3D location modeling solutions for the placement of indoor devices. 2. Optimal space-time location of public schools while considering closest assignments, capacities and budget constraints. Location of schools and student assignments in Mecklenburg County (2013) based on different scenarios minimizing travel costs, and facility costs, respectively.